Merry Christmas, friends! I took a blogging break to plan Christmas parties, shop, celebrate, and recover. We had a great Christmas with family, but sickness hit our house hard. Currently, the hubs is the only one not on antibiotics! We will persevere though...such is life. Every Christmas, my mom brings a honey baked ham that is beyond delicious. And, it always makes for great leftovers. 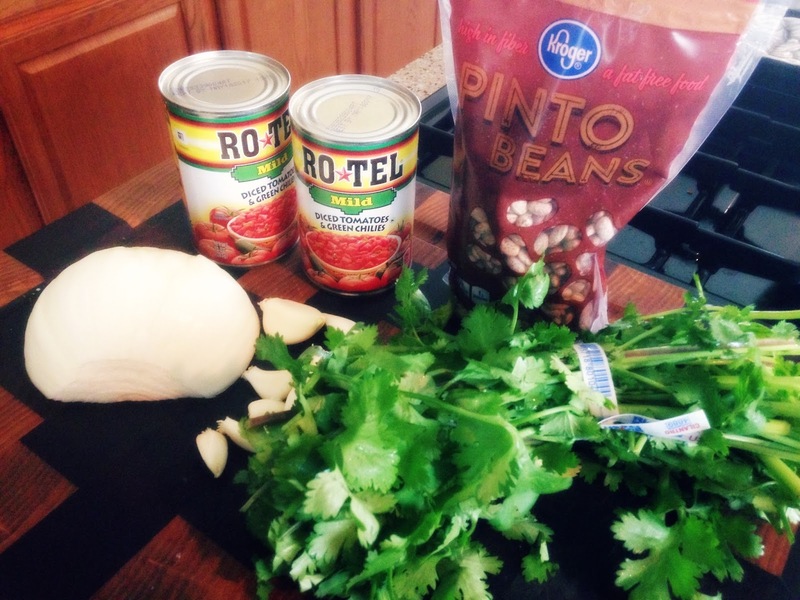 We are making some black eyed peas for New Years day as well as these yummy pinto beans. This recipe makes quite a bit so we will freeze half for a later date. So many options! Rinse your beans and discard any broken beans and/or rocks that may arise. Flash boil your beans - cover with water and bring to a boil. Let them boil for 2 minutes then turn off heat and cover for an hour. After they have been flash boiled, drain and rinse. Return to pain and cover with clean water. Add in your chopped cilantro, chopped onion, Rotel (drained), garlic, and preferred seasonings (the hubs loves his Cavender's Greek Seasoning). Cover this goodness and simmer for 2 hours. Watch your water - we like ours a bit "soupy," but the consistency is up to you! The ham should fall off the bone. Discard the bone before serving. We plan to serve ours with with homemade guacamole and sliced skirt steak. You can also top with cheese and sour cream or serve along side some warm cornbread. I hope you all had a great Christmas and are looking forward to the New Year! Stay blessed, happy, and healthy as we close down 2015. I came across your this post while trying to find information about blog-related research ... It is a good post .. keep posting and updating information. which is a immature share of the difficulties a lot of people unrecorded with sect now, but but making improved lives for group that is direction on feat them much , keeping them punter aid and making certain their kids get enlightened.